It’s that time of year again when many social media “professionals” publish their predictions for the coming new year. Rarely, but on occasion, there are less than general forecasts that hit the bullseye. More often than not, many of the predicted transformations, platform trajectories and overall suggested industry paths are more or less off base or plainly obvious already from the previous year. Although we don’t profess to be any more effective with a crystal ball, we believe we do have a fairly good pulse on the industry and have made some pretty on target predictions in the past. Though this is going to be one of our more lengthy posts, as we attempt to detail the background behind these predictions and outline where we see things going, it will be worth the read. What we believe is very different about this coming year is due to social media in general, as well as the main platforms have matured in significant ways over the last several years, making their current paths pretty obvious to many. Furthermore the consolidation of platforms like Instagram and WhatsApp, among many others have further shown an industry that has grown up. It is our belief that 2015 will see the rise of some very disruptive technology in the social, content marketing and search spaces. These required digital marketing components have become more and more disjointed and the gap in the playing field between the massive content sites and the small brand or blogger is widening at an alarming pace. Why Is A Change Coming? When an industry matures, what often happens next is consolidation. The acquisition of perceived current and/or future competition. We have seen this hold true in nearly every industry on and offline. Growth becomes more difficult as an industry matures and market penetration reaches critical mass, requiring acquisition to enable continued growth into new and adjoining markets. Let’s face the facts, the common thread across all digital marketing is CONTENT. In 2013-2014 Facebook taught us that content is not only key to social and digital marketing success, but more importantly we have to find better ways to utilize it and control it if we are going to be successful – OR – you are going to have to pay to get people to see your content online. Most of us now know that you must be consistently creating great content and getting traffic to that content in order to make it effective, however Mashable, Huffington Post and the numerous other massive content sites are dominating the noise, shares and traffic online. Everyone from large to local brands, as well as marketers and solepreneurs are now creating content, but are also competing with the plethora of content, news and celebrity sites where there is just no level playing field has become a big problem today and is only expected to get worse. Given the current state of social media and content marketing, you are left with four main options to get traffic to your content. 1) Huge Community – You already have a huge loyal social community built (Big Brands). This represents only about 1% or less of social media accounts. 2) Sharing Platforms (Triberr) – I’ll share yours if you share mine, but wait, you’re not sharing mine. Even when you do share mine, few in your social community care what you share and I don’t get much or any traffic. Are you sure you’re really influential? 3) Social Pay to Play – If you want traffic to your content on Facebook, you better start paying. Does it work, sure! Is it sustainable or cost-effective? We don’t believe it is. In 2015 we believe we are going to see technologies that will disrupt the status quo of the combination of social media marketing, content marketing and SEO/PPC marketing. 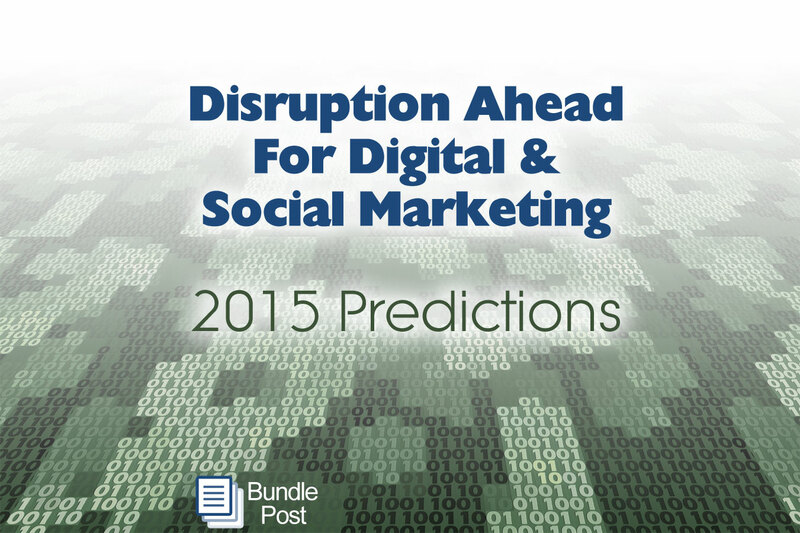 These disconnected marketing components are ripe for new and innovative technology that will deliver unique and disruptive capabilities in 2015. We believe technology that uncovers new and completely unique ways to drive traffic to content, provide paths to improved social ROI and diminish the SEO/PPC models we have seen over the past decade are going to be made clear very soon. 1) General Social Media Marketing – As social media marketing becomes more and more complex, new technology is required to make it easier, regardless of user experience, knowledge or skill. This is a requirement for the industry whose time has come. 2) Big Data – The internal, open web and social silo’s are disconnected and therefore not as useful as they could be. Solutions that connect open web content to traffic to social will change this for big and small brands. 3) Traffic To Content – Technology that levels the playing field for content creators, exposes their content to those that need it and expanding the social reach of content in new innovative ways will be realized. 4) SEO/PPC – Though never going away, Google has made it clear that the inevitable demise of SEO is a top priority. Using SEO and PPC for content traffic will become less useful, requiring innovative technology to replace it. 5) CrowdCuration – We believe we will see the rise of new technology called crowdcuration that will make curating and sharing unique content very efficient, while enabling social users to build new traffic, thought leadership and communities through this new platform. We will be writing a lot more on these 5 areas over the next 6 months, so be sure to subscribe to our blog, or add our feed to your BundlePost account. As always – AWESOME post! This industry is very difficult to talk about in generalities. It is SO fractured. Industries vary greatly, Geography matters, and I still see that almost every small business in America IS NOT “doing” social media marketing yet. Is the industry mature? Is it only mature for the big guys? 2015 is gonna be crazy! Thanks so much for the post! As an industry it is certainly mature. Is market penetration there yet, no and it won’t unless things change. That is where I see these things coming into play to expand market penetration and net results. Indeed it will definitely be a wild year for us as we dive headlong into these challenges. Exciting to know there are some disruptive changes on the way! Looking forward to seeing more on the content curation. Thanks. Good piece. It’s true most small businesses aren’t doing social media marketing yet and that provides a huge area for growth for social media practitioners. Yes if changes and innovations are realized it does represent a huge opportunity for agencies, marketers and brands alike. I am afraid if we stay on the current course however, things may be different. Thanks for jumping in Timothy! Reblogged this on Kimbas' View. Social media is such a wide and fragmented field. Everyone and their mother has an opinion on what it will become. And every year, they realize that they were more or less wrong. In the meantime, they focus on the wrong metrics and totally forget to engage with their audiences. To me, what would really be disruptive this year is the disappearance of the self-proclaimed guru and a bigger reliance on quality. And of course, more curation + creation mix. Oh we can so dream Cendrine. Unfortunately, there are millions coming into the field every single year and think proclaiming their expertise in their bio, without the experience and results to back it up will elevate them to prosperity or fame. I am not sure there is anything that will change that occurring.